I confess. I hate making pancakes. The first round sticks to the pan, you stand there for an hour flip flip flipping, just to get enough to feed your brood for breakfast with no leftovers. Every one that hits the plate gets claimed and gobbled up before the next batch comes off the skillet. I wind up eating my breakfast, consisting of the gnarled up pancakes the kids wouldn’t touch, standing up while continuing to flip. Nope, not for me. Too busy, especially knowing I will spend at least 30 minutes hands-on time in the kitchen for both lunch and dinner plus any time needed for the ferments, kefirs and what-nots. THEN there’s the clean-up. I’ve started doing oven pancakes instead. In fact, I’m lazy. I do oven pancakes AND cook my bacon in the oven. No huge, greasy spatters to clean up afterward and a cast iron skillet to wash by hand. To cook bacon in the oven, simply lay the strips out in a single layer on a rimmed jelly roll pan and put into a 400 degree oven until they’re done, 10-15 minutes depending on your oven and how crisp you like your bacon. Both the bacon and the pancake can cook at the same time, while you attend to other more important matters. The jelly roll pan fits into the dishwasher after the bacon grease has been claimed, making for quick clean-up. Oven pancakes are FUN. They get big and poofy in the oven and then collapse as they cool. You cut them into pie-wedges then drizzle on the sauce. Your kids will enjoy standing at the oven door, turning the light on and peeking through the glass to watch the growing glob of batter. The recipe will be included in this Thursday’s menu mailer. 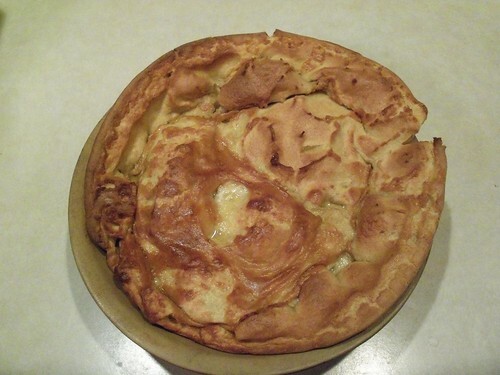 The picture above is of the pancake, fresh out of the oven, in my Pampered Chef stoneware pie pan. Combine all ingredients in a small saucepan and heat over low heat until the peanut butter has smoothly incorporated into the sauce. Thin with milk or water, if needed, to reach the right consistency. I had the same problem with pancakes being eaten too fast, then my brother gave me a grill, now I can feed three children at once. I love pancakes and bacon. I too bake our bacon, because I haven’t the patience to stand and cook curling bacon slices with all my college homework hollering for attention. I have two large two burner griddles, one electric, and one gas, that the children beg to use, so we have griddled pancakes at least twice a month. But we like oven pancakes occasionally, too! I will be trying out your Peanut butter pancake sauce on the children this very weekend. Thanks KerryAnn. Wow Id really love to know more about the pancake in the picture! I clicked on the link to the mailer and it was an error! 🙁 Looks so yummy. I’m also sick of greasy splatters and hate doing pancakes …. sounds like a resolution to me!!! Cannot wait for my 5 month old son to be able to stand and peak in the oven at the treat I make for him!